Join the mighty Caesar at the beginning of his glittering career of conquest and refight one of his most famous battles against those heinous enemies of civilisation, the dreaded Germans led by none other than that ambitious fiend Ariovistus of the Suebi. March with Caesar’s legions into the land of implacable savages as our hero subjugates the barbarous Gauls and confronts that most dangerous of moustachioed monstrosities the treacherous chieftain of the Arverni tribe, Vercingetorix. Cross the Rubicon and cast your own dice as Caesar pursues his rival Romans across continents in the Roman Civil War, facing his most deadly challenge yet in the form of famed conqueror of the East, Pompey the Great. Fight by Caesar’s side as he wages war for mastery of the Roman World upon battlefields soaked in Roman blood. 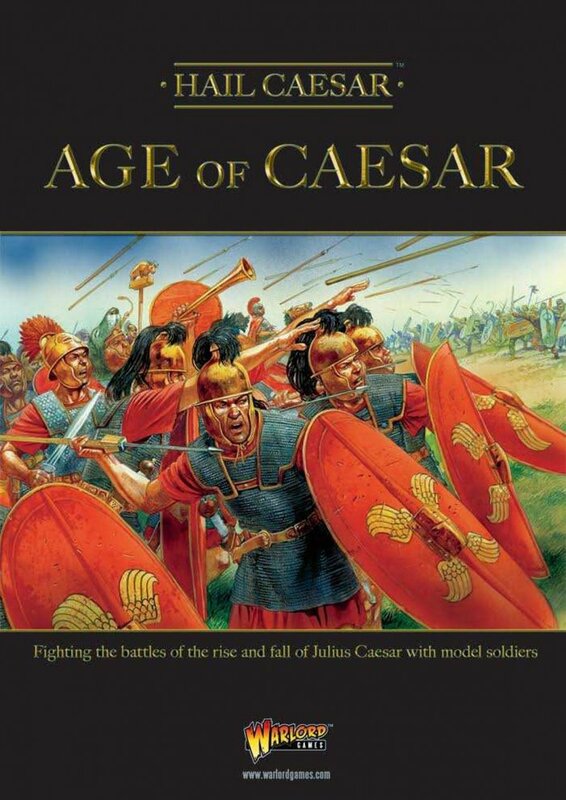 With this supplement for Hail Caesar we invite you to come, see and conquer for yourself in a series of new scenarios representing key battles in the career of Julius Caesar. We take a detailed look at the armies of Rome and her enemies, and we consider the lives of some of the greatest Roman commanders of them all, together with suitable rules to represent them on the tabletop.